Editor’s Note: For this blog post — which we expect to be the first of many to come in a series — we asked a few of our educationally focused staff members to make recommendations on a read or two worth pursuing. Here, we include the reader’s thoughts about the title selection, along with an image of each book cover and link to Amazon to purchase the book or download it to read on a tablet. This book guides the reader in finding ways to address the diverse needs of students in a classroom. 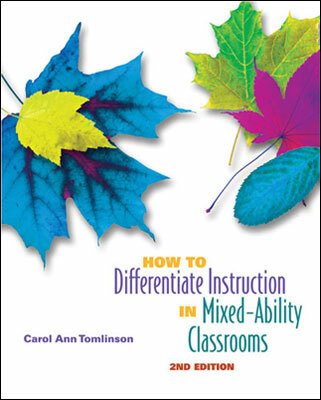 The author breaks down differentiation and demonstrates how it is feasible both in planning and in the classroom. I have found this information useful when planning and differentiating instruction in my courses. The workshop model for teaching and learning is useful for any educational setting — from a small Eagle Rock classroom to a large public school. This book profiles real classrooms using the workshop model with systems, structures, and rituals in place to create learner-centered experiences. 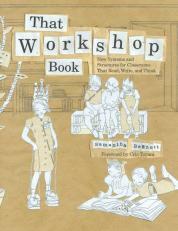 The workshop model is particularly useful for managing a classroom of students of different ability levels. I use some part of the workshop model in every class I teach. It was back in 2001 when Jen Frickey first made the trek down here to Colorado — and eventually Eagle Rock — from her home in Canada. She was barely unpacked before she got right to work, serving as an intern in our Human Performance Center (HPC) as well as a Ponderosa houseparent. Jen was later promoted to instructional specialist for the HPC and transferred her newly acquired house-parenting skills to a stint at Lodgepole. Then she left us in 2008 to return to Canada. 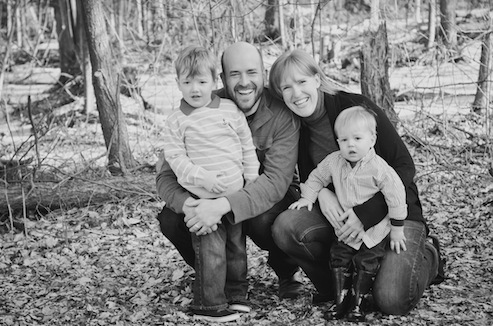 In the ensuing years, Jen and her husband, Jimmy, worked at Family & Children’s Services of Renfrew County (Pembroke, Ontario). After helping that organization investigate and create alternative high school options for teens in their care, Jen spent another two years coordinating its education and training foster parents. She says she had the opportunity to “take advantage of the Canadian health care system” and enjoy some time off when each of her children were born. Eagle Rock: What do you do here at Eagle Rock? Jen: As director of curriculum, I get to work with the leadership team and oversee the learning experience of our students. I work with the instructional team to develop innovative and engaging learning opportunities, and critically examine how our curriculum aligns with the five expectations. In my work, I strive to ensure that we’re graduating empowered and energized young people ready to make a difference in the world. I love that my job gives me the opportunity to work with both staff and students who are passionate about creating change. Eagle Rock: Where did you receive your education? Jen: I earned my master’s degree in educational leadership through Walden University in 2006, and did most of my previous studies through Queen’s University (Canada) where I received my B.Ed, B.P.H.E and B.A in 2000. Editor’s Note: It’s a bad use of an idiom, but we’re not out of the woods yet when it comes to the devastating flooding that visited our area of Colorado like an unpopular substitute teacher this past month. But just as Eagle Rock is now a designated National School of Character, we’re going to have the opportunity to prove we earned that honor this coming semester. Here’s an update of Jeff Liddle’s latest email to parents, sponsors and students. Earlier today, we sent out a memo by email to parents, sponsors and students in an attempt to bring everybody up to date on the recent flooding in Colorado and how we intend to conduct business this trimester. For starters, we’ve arrived at a start date for this trimester and that date is Sunday, Sept. 29th for veteran students. The trimester will end on Saturday, Dec. 14th to ensure we have time to fit in the normal amount of credit. Our email message to students, parents and sponsors outlines flights, carpooling options, and other logistical issues, but what I want to discuss with you here is what our students can expect from us when they walk back on campus later this month, and what we expect from them. First off, our campus is in fine shape. Not so for the town of Estes Park and everything else down the canyons. Fact is, by sometime next month, there will only be one route in and out of town, and that’s Highways 7-119-70. And while that route is in good shape, the commute to and from Denver International Airport is about three hours. Other roads will eventually open, but we don’t have a solid indication yet as to when those events will occur. The good news is the utilities are consistent and they are on. The gas, water, electricity, sewage, Internet, and phones are all working. Also working are the merchants in town, including those at the Safeway market, gas stations, coffee shops, the library, and many local shops. And we are getting food deliveries to campus with no problem. One of the major highlights we all shared here at Eagle Rock late last year was the honor of being designated as a National School of Character. 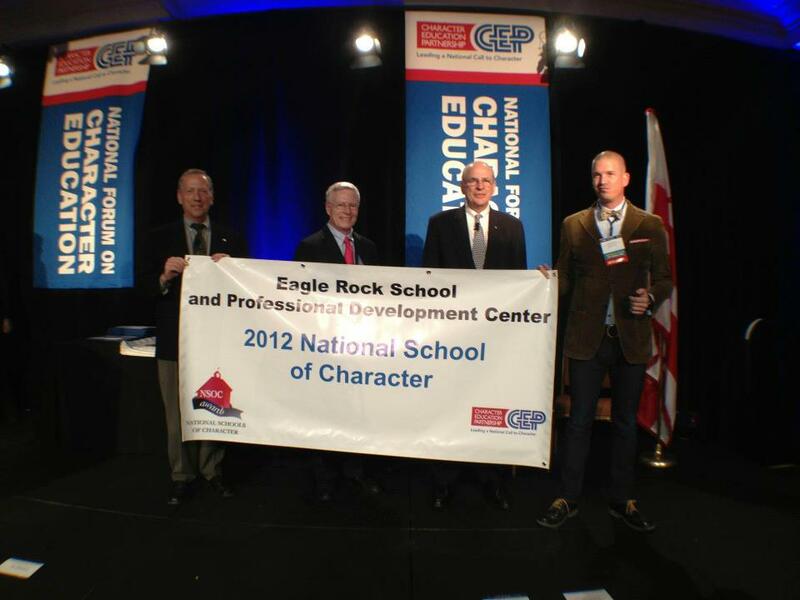 Dan Condon (far right) representing Eagle Rock at the 2012 National Schools of Character ceremony at the National Forum on Character Education. It’s quite an accomplishment, but what exactly does it mean to be a school of character? Those learning institutions that are designated as National Schools of Character (NSOC) have all demonstrated through a rigorous evaluation process that character development has had a positive impact on academics, student behavior, and school climate. And these so-honored institutions aren’t expected to sit back and glory in their uniqueness as pillars of character. Instead, schools like ours here at Eagle Rock are fully expected to serve as models for other academic learning centers, helping them to achieve the same results. Editor’s Note: The recent flooding in Colorado has been debilitating to much of Estes Park, including the roads in and out of town. This is an update to Jeff Liddle’s email to Eagle Rock School parents and students about the status of the clean-up and Eagle Rock’s plans for the start of school. Hey Eagle Rockers! Estes Park is drying out and mopping up!! I attended the town meeting Tuesday for an update on the state of affairs, and apparently there’s been $100,000,000 worth of infrastructure damage to public works (roads, utilities, etc.) in Estes Park alone. There are some heavily damaged areas within town that will be offline for months — but these areas don’t directly affect Eagle Rock. The Colorado Department of Transportation has reallocated resources to the Boulder/Fort Collins/Estes Park area and the top priority is to open up routes to Estes Park. Despite the challenges, I’m happy to report that there was a noticeable sense of optimism during the town meeting. What I found particularly moving were the stories of residents coming together and working around the clock to patch this town back together. I’m typically not the first guy in the room to get all teary eyed, but for the last few days I’ve been choking back a lot of emotion. I cannot express how grateful I am for all the first responders, public officials, and community members who are working to reopen Estes Park as soon as possible. Their work, in turn will also make it possible for Eagle Rock to reopen its doors. On campus, we have been busy adjusting schedules, planning classes, participating in professional development and volunteering as part of the recovery effort. We’ve managed to fill our two additional weeks with plenty of work. Today is the first day we’ll have the majority of staff back on campus. Being reunited with everyone will surely be emotional. We have not seen each other since the flood washed out the canyons and created a lot of distance between our homes. It will be good to be together. In my last update, I mentioned that we would not start school any earlier than September 28. I still don’t have a definitive start date, but I can report that we are progressing in a very positive direction and I hope to set a date by the end of this week. We’re all anxious to get students back on campus just as soon as all the pieces fit together. Once again, thank you for all your kind and supportive thoughts. Look for the next update on Friday.